Dillard Bluegrass and BBQ Festival: July 31 and Aug 1 – Georgia State Barbecue Championship. 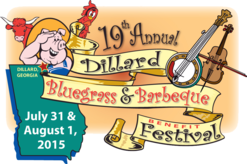 Come stay at Beechwood Inn and Attend the Dillard Barbecue Competition and Festival. The Dillard Barbecue and Bluegrass Festival started in 1997 and has grown to what it is today through the hard work, dedication, and efforts of many volunteers and BBQ enthusiasts from around the country. Come to the Dillard Barbecue Championship and Bluegrass Festival and stay at nearby Beechwood Inn.